The Wedding's primary priority is to communicate with their fan base, on both the musical level and a spiritual level, expressing their commitment to their faith and hope through their songs. As The Wedding express and entertain the listener with their unique sound found in their music, they will also deliver a message of healing and forgiveness in Christ. Kevin Kiehn explains "We stand up for what we believe in, which is mainly our faith. We're just four guys who face a lot of the same stuff everyone our age does, but we can turn to a faith that's not of this world to deal with it. We want to provide a path to hope for this generation and let them know that there's a God they can relate to." Trevor Sarver declares, "We just want to be so honest with our fans and just people in general and let them know that Christ loves them and there's always bumps in the road, but if you just call on Christ, he'll take care of it. Christians a lot of the time get too scared to say something or uphold what they know is right, so they rebel from what Christ calls them to do. but in all actuality, when you strip everything down." "JESUS IS THE MOST PUNK ROCK THING TO EVER HAPPEN TO THE WORLD. The guy went against everything and freakin died for it. Bottom line." The Wedding Members: Trevor Sarver (guitar), Kevin Kiehn (vocals & Keys), Cody Driggers (bass), and Clint Robinson (drums). Their ages range from late teens to early 20 something's, and their music is precocious for such a young group of performers and song writers, who each bring their own unique gifts to contribute to their songs on their new CD, THE WEDDING. They have just begun evolving and growing their sound, music, and message in their Christian music ministry. It is this reviewer's opinion that they are off to a terrific start! Their music, described as being an interesting blend of "Crunching Rock, Punk, Indie, & EMO," offers a menu of spirited songs which can be described as being a refreshing blast to a poignant flowing of well-played energy, musicianship, melody, and message. Besides their energy and drive, interesting melodies, and messages, some other characteristics of their music which make this reviewer's heart soar like a hawk are the interesting musical compositions one hears, (counter melodies / rhythms/ rifts). I especially appreciate the precise, always together, sometimes pounding, sometimes delicate guitar melody / rhythms and support chords, whether on the beat or in syncopation. Also most enjoyable is the use of the piano in the songs, especially the flowing worship ballads, as solo work and in a blend of guitar work as well in such cuts as (PRICE FOR LOVE, BUT A BREATH & BLEEDING FOR HOPE); songs which would find a home in contemporary worship services. The strong vocals are on key and very clear in diction, despite the vocal style being used - whether punk, rock, screamo; (see MOVE THIS CITY Bridge) or melodious. Backup vocals and harmonies are also well done. They also use dynamics effectively and a variety of artistic creativity in their compositions to add sparkle, nuances via guitar rifts, and other instrumental embellishments. No monotony problem is found in their music, which has been my main stumbling block in the past in being able to wrap my mind around the original pure punk sound. It is indeed a wonderful mix of "Crunching Rock, Punk, Indie, & EMO", which support and elevate the lyrical messages of their songs. All of their efforts come together so nicely and so effectively to not only present their own unique form of music, but also express so well their own faith and hope in Christ, in sometimes subtle ways that are appealing to their young fan base and others, and have been a starting point for discussions about Jesus with their fans who come to their concerts. Any Scriptures which inspire you personally as Christian music artists? Trevor Sarver answered, "For me personally (Trevor) I love Jeremiah. He just looked at God and said, Lord how in the world will I go and speak.I'm only a youth, and God said, no don't worry I'm going to use you to take over the nations. I love that book of the bible cuz we're all still teenagers and really young and there's not really anyone else this young doing what we're doing at the pace we're doing it at and sometimes its intimidating but we know for sure that Christ is right there along side of us using us to take over the nations even though we're only youth." It is always interesting to see how the Lord uses an artist's faith, musical gifts, and opportunities through family, church and community to build a person's ability to be successful in a Christian music ministry for the Lord. The spiritual seeds of their Christian faith were planted early in all of their respective lives. All four members of THE WEDDING were blessed with a Christian-growing environment provided by both their believing families and their respective church families in Arkansas. Trevor Sarver, Kevin Kiehn, and Clint Robinson share with ChristianMusic.com, about their growing up years and their early training. Trevor Sarver shares, "In our early life stages we all grew up in Christian homes, I myself (Trevor Sarver) am a pastor's kid. So I was always in church and all that. The other guys have extremely Christian based families and we've all been raised to love Christ with our lives which is what we're trying to do with this music thing also." Kevin shares; "Well, I was raised in a Christian home like you usually hear from a lot of Christians, and yes I believe I was blessed to have that. I was home schooled until my 8th grade year, then I went to a private Christian school where I finished out my high school years. I'm the oldest of 6 kids, most of whom are still home schooled by my hard working mother. I have a great relationship with my family and always have. They are very supportive of what I do and you really need that in this business." Trevor continues, "We all found the Lord early in life and each had a time when we just confessed to Him "God, I need you, come into my life and change me." Kevin explains his experience by saying, "I accepted Christ when I was very young. When I was 6 years old I accepted Christ into my heart without the aid of a pastor or even my parents. I just knew in my heart that he was calling me and I responded. So right there in my backyard on my swing set I decided to make an eternal commitment to Jesus Christ. Now because of how young I was when I accepted Christ, there have been times in my life when I doubted my salvation. However, I believe now that that was just Satan getting to me. I believe that I had the faith of a child that day and that's all God needs is the faith of the child. The Bible says that without that kind of faith you can't enter the kingdom of heaven." Clint Robinson shares his family's support of his faith and his musical gifts, and how he, Kevin and Cody were introduced to music ministry as teenagers. "Well, I started playing piano when I was 7, then when I got in to middle school I joined band. Through high school I played percussion and competed in various regional, state, and national competitions. Along with my family's support I was able to receive lessons from some great professors in percussion." Clint continues, "In junior high, me and Kevin and Cody started playing in a worship band together that led at our church's bus ministry, We continued to play in the bus ministry 'til we were out of high school. Our senior year me and Kevin started playing with Trevor and then later Cody started playing with us as well, and then we became The Wedding." Clint reflects on the value of this early ministry experience. "I think bus ministry has a lot to do with preparing us for the roll God had for us. Playing for kids who didn't have anything, and just being able to invest and love those kids who were unloved. I see now how much it prepared me, and each night we play its just habit to talk to the kids and see what's going on in their lives." Trevor Sarver, Kevin Kiehn, Cody Driggers, and Clint Robinson, having just themselves gone through the teenage years and are still experiencing young adulthood, can easily relate to the challenges facing youth and young adults in our society, and have expressed beautifully their experiences and what they learned through their music, which in turn speaks to their listeners. For despite their strong Christian roots and belief system, THE WEDDING band members didn't escape the trials, tribulations, and challenges of experiencing the teenage years, though they had the spiritual training & relationship with Jesus and their own families to rise to meet challenges and also in some instances get back on the right track. Trevor comments, "Everyone has their hard times though, I personally have had extra hard times." It isn't always easy being a PK (preacher's kid), and Trevor Sarver shares his ups and downs, specifically his struggle with the sometimes irresistible desire to "fit in" with the crowd, and also perhaps a little with rebellion. Both are challenges that many teens are tempted by in their quest to become independent from parents. Trevor explains, "I just strayed away from Christ a lot as a teen and got into stupid stuff that wasn't cool at all. Mainly just peer pressure. The rest of the guys kept their head on straight for sure. God's an incredible God if you just make sure that you love him with all your heart, mind and, soul and let him teach you new things every day." It is a powerful tool in keeping on a personal walk with the Lord if one has a Christian support system and a fellowship with other Christians, as well as a consistent quiet time with Jesus, as illustrated in the answers Christianmusic.com received from the band to our question below. What were/ and still are your Spiritual Influences? Trevor reflects, "Wow, influences.Um spiritually I do know that we all as a band look up to our parents for spiritual guidance all the time. Obviously we look to Christ, but probably parents second. A lot of the time we look to each other and our pastors at home at the churches we all go to. There's so many people that you meet that you tour with who become spiritual accountability partners too. We all have so many friends who just randomly call us and want to know how we're doing spiritually and that totally influences us." Clint explains, "My parents definitely have helped me keep it real, a lot of times when kids get out of high school and on their own, they tend to start going down roads they were raised not to go down, but the way my parents invested in my life kept me away from all that." Kevin - "As far as influences go, since I was raised in a conservative home schooled home, and I'm not dogging that in anyway, but because of that, the music I listened to was very limited. At the time my parents believed that their kids should only listen to Christian music, but not just Christian music, music that was more praise oriented. And I am thankful for that because in a lot of ways that has made me, as a vocalist, have a lot different mindsets as maybe others wouldn't have". Growing up, What were your collective musical influences? Trevor explains, "Musically. we have such a range on musical influences from just straight up punk rock like Rancid, (old) MxPx, Operation Ivy, the Ramones, the Decendents. All the way to western like Johnny Cash, Meral Haggard, and then also hard-core and metal bands then also stuff from back in the day.the Cure, the Police, U2, and all kinds of stuff. With 4 guys in a band that all love different stuff, there's a pretty good variety going!" Clint shares, "One of my biggest influences in high school was Further Seems Forever. 3 years ago I saw them for the first time at Cornerstone and its was the best 45 minutes of my life. And what rules about that, is this was our first year to play Cornerstone, and we played the same stage I saw Further Seems Forever on for the first time." Kevin reflects, " I got into the music scene a lot later than other kids and all of the influences that I have are actually just in the last 5 years. Most of the bands still tour and I don't really have any legendary musicians that I draw inspiration from. However, there a couple front men that I really look up to. The vocalist for Sinai Beach (I think that's how you spell it) really touches my heart with his testimony every time I see them." ChristianMusic.com: How were you led by the Lord to use your musical gifts to write and sing songs? Clint reflects, "We just knew it, right out of high school we felt it, we knew exactly what God wanted from us, and looking back it's so amazing it actually worked out." Kevin explains, "I've been in one band or another since I was in 8th or 9th grade. And I've been singing, or whatever, since I was a little kid. I've always known that God was going to use me in music. I honestly had no doubt in my mind. I didn't know that I'd be blessed with doing exactly what I wanted to do musically but God has a way of blessing you when you give Him control and let Him decide what you're going to do." Trevor shares, "Man, we always had a song in our heart. That's for sure. We always loved music and loved Christ. And if you REALLY love Christ then you'll take everything you have and devote it to showing people how freakin real he is and how he offers a peace that's just insanely amazing. But we aren't gonna go and shove it in someone's face, we're just here to put it out there and if you want it, cool. And if you don't, that's fine also. Its their decision." Trevor continues, "When we started this band a while back, we knew EXACTLY what we needed to do. That was to be a legit band that tells it how it is, but not in some cheesy way. Not saying that's bad, just saying that's the way we personally feel called to say it. God's given us a mountain to scream what we believe from, and the day we quit screaming from it is the day we're dead." Trevor summarizes, "So all in all, we were led to lead music by just loving it and then knowing that if it's what we wanted to do, then we were gonna do it for Christ in a real way with respect for ABSOLUTELY EVERYONE even if they don't choose to believe it too. With us believing it, and them not, doesn't make us any better or worse than them, we're all just people, we're just trying to share the happiness we have and meeting so many awesome people along the way." Trevor Sarver, Kevin Kiehn, Cody Driggers, and Clint Robinson all realize that how they live their lives and their behavior reflects to the world around them, especially their fans the band's belief in Jesus and the Christian way of life. It is true that Christians are scrutinized and held to a higher level of behavior, even though Christians aren't perfect, just forgiven. In answering the following question, Trevor, Kevin, and Clint offer what they have learned so far in their walk with the Lord. ChristianMusic.com: Any life-molding experiences you all would like to share with us, which were uplifting or were difficult but shaped your thinking, you music, your outlook, your spiritual walk? Trevor thoughtfully comments, "Man, our lives up to this point are just molding experiences. Every day we have something new that we take in and try to help mold us to be closer to God. Our producer/A&R rep Mark Townsend is definitely a 'molder' if you will. He is always keeping us grounded always reminding us that if we just love Christ, then everything will fall right where its supposed to. So he would definitely be an uplifting molding experience that we just so happen get to experience every time we're around him." Trevor Sarver expresses some frustration which exists in the Christian music industry community, because of people with spiritual conflicts in their lives aren't willing or able to work on it, thus offering an example of living which isn't a good witness to being a Christian, giving the secular world an excuse to deride Christianity. "It rough being out in a 'Christian' market too. I mean, lets get real.Christians have problems but it drives me insane when people understand they have a major life altering spiritual problem and don't do anything about it. And there's so many people like that in this industry. I'm not perfect, never have been, never will be. But I'm just saying that in this little 'Christian bubble' call the 'industry' people need to realize that people see the way a lot of them are really living and they're bashing our Christ's name from that. That would be an experience that is difficult but at the same time, you just gotta learn from your mistakes." Clint shares some important values he has learned in his life, "Integrity, being able to say no to what you are offered, not doing things even if you think they are ok, but realize that they would discourage and disappoint others. Live a life without compromise, striving for the perfection and purity Christ showed. Always be aware of who you're around and how your actions could affect their outlook on Jesus Christ, Cause as Christians we are called to represent Christ and His love." Kevin reflects, "I've led a pretty mellow life. I haven't really gotten into anything crazy. I've never had someone really close to me die. I've never had any traumatic experiences. Pretty much the big task for me is to try to see everyday as something special. Even though we're doing what we love, sometimes each day can seem the same and we can get really complacent as Christians. But we just have to realize that God has a plan for every day and that every day can be something new and exciting." As stated above, Trevor Sarver, Kevin Kiehn, Cody Driggers, and Clint Robinson started to express their love and gift for music in their preteen years. In junior high, they started off playing music in junior high in garage bands, playing in their various garages with the support of their understanding families. Kevin Kiehn, Cody Driggers, and Clint Robinson called their band, LAST PLACE, which morphed into the band UNKNOWN. As UNKNOWN, they began to play gigs out in the community, not just for their circle of family and friends. They often opened for the local popular band, EASIER SAID, where they met Trevor Sarver, the guitarist for EASIER SAID, who encouraged Kiehn & others in the UNKNOWN to continue, helping them find opportunities to play. Kevin Kiehn said, "EASIER SAID band members were a lot more well known and cooler than we were." In their late high school years, EASIER SAID had band membership changes, and an opening for a drummer, and Clint Robinson came on board. About 6 months later, when the other original EASIER SAID members left, Kevin Kiehn also joined as the bass player, and they became a 3 piece pop/punk band. Deciding to go for it on a full time basis, EASIER SAID, (Trevor Sarver, Clint Robinson, and Kevin Kiehn) went on tour, bringing good friend and fellow musician Cody Driggers, along as a "roadie" who proved to be valuable, working behind the scenes and playing bass guitar part time. Because of his musical contributions to the group, Cody Driggers became the full-time bass when Kevin Kiehn switched to vocals and keyboard, which was the beginning of the development of their true musical sound and style. Kevin Kiehn continued to write lyrics for this new band's original songs, which fit like a glove to each unique musical composition. 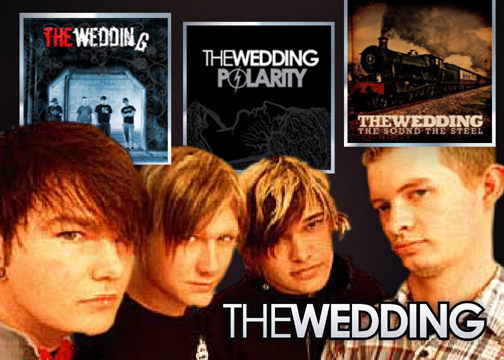 As their music evolved and solidified into their own unique musical version of indie rock, they decided to start clean and renamed their foursome THE WEDDING, inspired by the book of Revelations. Step by step THE WEDDING followed the Lord's plan for them. Doors continued to open for them on the tour scene, as they had the opportunity to open for other well-known Christian bands such as Bleach, John Reuben, Number One Gun, Anberlin, and Spoken. Impressed by their musical talent, professionalism, and the quality of their original songs, Bleach guitar player Sam Barnhart became their mentor and brought THE WEDDING to Nashville's Dark Horse Studios to make a revised demo under his direction. While at Dark Horse Studios the band members were introduced to The O.C. Supertones and well-known and successful producer, Mark Lee Townsend, who produced CDs for RElient K, dc Talk, and Jennifer Knapp. Mark Lee Townsend was impressed by THE WEDDING, and helped them mix their new demo and later passed the demo on to BHT Entertainment, while THE WEDDING went on tour with O.C. Supertones by their invitation, becoming the O.C. Supertones' opening band. Meanwhile, Rambler Records, which is the "alternative division" of BHT Entertainment were impressed with THE WEDDING demo and their performances on tour with O.C. Supertones as well. Soon, they offered THE WEDDING a beginning recording contract, the golden ring which is dreamed of by many up and coming Christian artists, groups and bands. In April of 2005, their first CD, THE WEDDING was released to the delight of their enthusiastic young fans and others who are young at heart, and open to new creative forms of Christian music. It is always interesting to find out how artists view their music, so Christianmusic.com asked them, "How would you describe it?" Trevor Sarver answered, "Our music? Energetic indie rock with punk and hard-core influences.just good ole rock n' roll for the masses. Ha ha ha!" Kevin - "Energetic, besides that I'll let the listeners decide." Clint - "Energetic, fun, Indie rock with punk and hard-core influences. All I can say is we play the music I love, And I can't even describe how blessed it feels to be able to do it every night." "How do you compose your songs? Do you compose from a keyboard or guitar? Group jam sessions? Do you split the work - someone does the musical composition and someone else does the lyrics? - Or what comes first, the lyrics or the melody / composition?" "What we do is Trevor will usually bring some sort of riff, or chord progression to practice the rest of us can work with. Then Clint and Cody play along and pretty much they just play until they hammer down the basis of a song. If we think the song calls for keys, either me or Clint will write a part for it." "Then, after the song structure has been decided, I'll listen to it and write lyrics and vocal lines. It's pretty much an even split, we all contribute and we all write our own parts. It comes together really well, I don't think we could write any other way." Trevor adds, "We don't have a specific way of doing things really, we just all come up with ideas on the guitar or keys or even just in our heads and then get together and work it out as a band, then Kevin comes in and puts the lyrics on top of it all. Most the time he already has the lyrics written." Clint also shares, "Well lately, me, Cody, and Trevor get together and jam out songs, get the basic structure down, and then Kevin comes and writes the melody and then if need be we change some of the music up a bit according to the vocal lines." This team work is very much evident in their compositions which support the lyrical messages, written by Kevin, on this CD! It is obvious that they work well together in the Spirit, as their collective talent and experiences have come together so well and so effectively to present this impressive collection of songs to the listener. They love playing music together, with the focus being on ministering to young people, helping them by providing songs that explore the experiences of the young and that explore who Jesus is, how He can be involved in our lives and having a relationship with Him brings a joy and peace, despite the circumstances of our lives. THE WEDDING is still in the process of growing and evolving as Christian artists. Trevor Sarver shares that he has been busy between the band's tours, while at home in Arkansas, recording new ideas for the band's next CD. "Here lately I've actually just been writing a ton for the next record with our time off from the road, even though our 1st record just hit stores, ha ha ha!" But yeah, I've been putting some tracks down in this guys home studio in Fayetteville Arkansas where we're from. Just to kinda have ideas still flowing and keeping the ole brain still churning." In the coming years, it will be a pleasure to continue to listen to their music and see and hear how they evolve in their musical endeavors, as they grow and change in the process of maturing and evolving musically and spiritually. Though the music on this CD is aimed at the younger generation to encourage them, I enjoyed and was blessed by this collection of songs and this CD would add sparkle and variety to anyone's Christian music library, and I recommend this listening experience. As people don't live in a vacuum in this world, Christian music artists find that what they have learned from their own life experiences, guidance from the Holy Spirit, own spiritual journeys, and from those people around them, are great sources for the spiritual messages / truths found in their songs, which in turn bless the listener. This is also true for THE WEDDINGS' lyricist, Kevin Kiehn. Kevin shares with ChristianMusic.com, "When I write the lyrics I take whatever state of life I'm in at that time and I try to be honest. I try to take life experiences, as you said, and put them in my lyrics to encourage kids. Its important people know that guys in bands have the same problems that they do and that we can completely relate." Trevor Sarver confirms how Kevin creates the lyrics, which Trevor, the other WEDDING members and their audience can relate to as well. "Kevin writes on all kinds of stuff but mainly based on real life scenarios he's gone through or seen physically or spiritually. We sing about so many things God, Life, girls, and even just a hint of politics. Christ is in all 3 of those subjects so why not sing about them? Kevin has a really original way to do things. He's EXTREMELY honest in his lyrics spiritually and also with his songs about past relationships and stuff like that about how there's turmoil but by the end of the song its like he's told a story and how there's forgiveness and peace at the end of a relationship gone bad. It's really cool". Though the messages are aimed at the age group of their fan base, others can relate to them as well. Some of the experiences and truths explored in the lyrics, do relate to all human beings at one time or another, though seen through the eyes of a perceptive young person. Some of the messages apply to all human beings, no matter what their age. The songs which explore Jesus are universal for all.